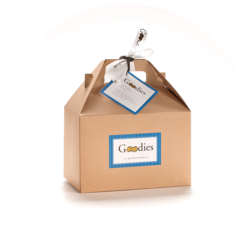 GOODIES is a women owned and operated gift box cookie company located in Arlington, MA. The cookies are handcrafted and baked in small batches using the finest quality, all natural and locally sourced ingredients. Are you looking for a way to thank someone for their business, welcome a new baby or neighbor, cheer up a homesick college student or simply to sweeten someone's day? A gift box of GOODIES is a gift in good taste, and a gift that tastes good! Visit us at www.goodieshomemade.com or call us toll free at 866-433-3757.